Darlington Raceway hosted its throwback weekend for the third consecutive year, and with many others Roush Yates Engines contributed to the throwback fun. The Ford Performance/Roush Yates Engines team was seen wearing white patched button downs and the iconic styled rope trucker hats that can be purchased here. Darlington’s historic Southern 500 was especially heartwarming this year as Robert Yates was honored on the No. 10 Stewart-Haas Racing/Danica Patrick Ford Credit Ford Fusion. Her paint scheme was mirrored from the Robert Yates Racing era in which the iconic blue-and-red colors were seen on Dale Jarrett’s No. 88 Quality Care/Ford Credit 1999 Championship car. Patrick’s car was also voted as the best throwback paint scheme this year at Darlington Raceway. Special THANK YOU to all of our partners who were involved in this year’s throwback; Ford Performance, Mitsubishi Materials USA, Safety Kleen, RKL Solutions, Mahle Clevite, Cometic Gaskets, Universal Technical Institute, Mastercam, Mitee-Bitee, Rottler, Starrett and Converge. See our photos below from this memorable weekend! KESELOWSKI CHASES DOWN 2nd NXS WIN OF THE SEASON! 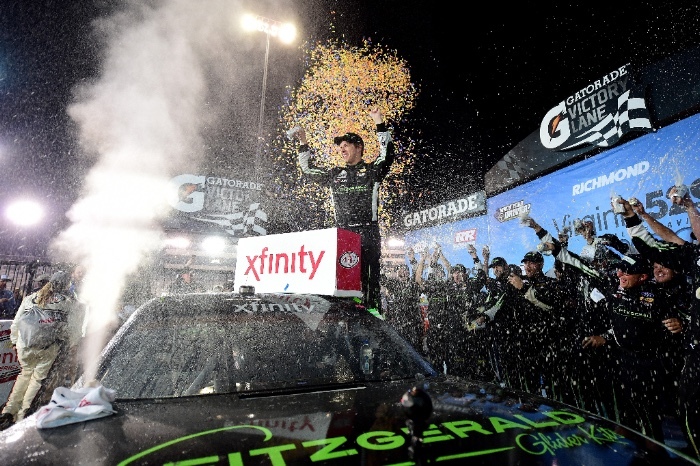 RICHMOND, Vir., September 9, 2017 – Winning his 36th NASCAR Xfinity Series race of his career, Brad Keselowski took the No. 22 Team Penske Ford Mustang to victory lane in the Virginia 529 College Savings 250 at Richmond Raceway on Friday night. Keselowski, had the perfect set up for the long run and the power of the Ford FR9 engine to battle Kyle Busch for the win. The No. 2 was able to conserve his tires and navigate through lapped traffic to make a final pass and take the lead with 15 laps left in the 250 lap race. Keselowski never looked back, building a 3.008 second lead before taking the checkered flag. 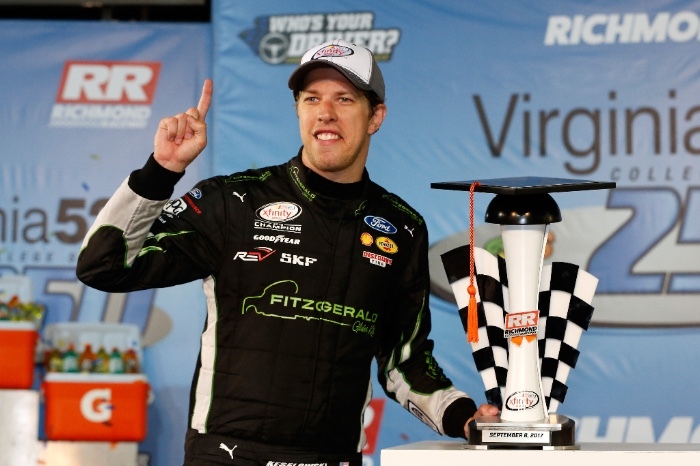 On his way to his second NASCAR Xfinity win of the season and fifth for Team Penske, Keselowski collected a second stage win and lead a total of 25.5 miles on the .75-mile track. Full-time Xfinity drivers Ryan Reed and Cole Custer finished P12 and P14 respectively, while securing additional points for the NXS Playoffs. The Xfinity Playoff field will be set after next weekend’s race at Chicagoland Speedway, September 16th. Reference the full 2017 schedule on www.roushyates.com. 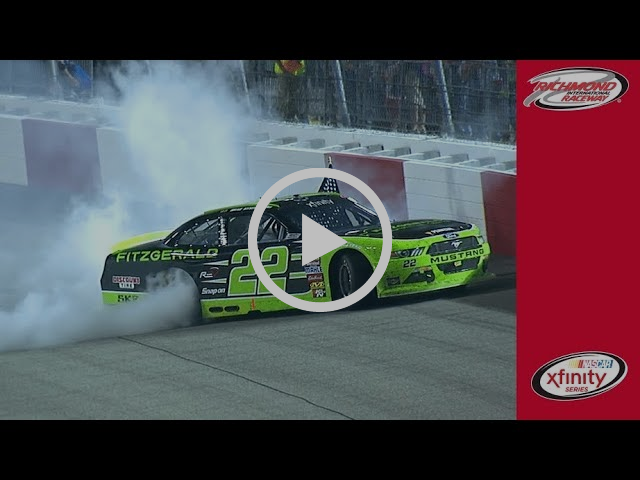 Brad Keselowski performed an impressive burnout in celebration of his NASCAR XFINITY Series victory at Richmond Raceway. 13 CHAMPIONSHIPS • 306 WINS • 277 POLES! Roush Yates Engines is a leading edge engine development company, with 3 state-of-the-art facilities based in Mooresville, NC; which include Roush Yates Engines, Roush Yates Performance Engines Group, focused on road racing and Roush Yates Manufacturing Solutions, a world class manufacturing center and ISO 9001 / AS9100 certified. The company’s core business includes designing, building and testing purpose built race engines.Ford Performance in partnership with Roush Yates Engines is the exclusive engine builder of the NASCAR FR9 Ford V8 engine and twin-turbo EcoBoost Ford V6 race engine that powers the Ford GT super car.With the unparalleled culture of winning and steeped in rich racing history, Roush Yates Engines continues to follow the company’s vision to lead performance engine innovation and staying true to the company’s mission, provide winning engines through demonstrated power and performance. Follow a unique behind the scenes 10-week video series from Ford Performance, documenting the various aspects of the Ford Performance NASCAR program. Five Ford drivers, including Ryan Blaney, Kurt Busch, Brad Keselowski, Kevin Harvick, and Ricky Stenhouse Jr., are part of the 16-driver field that makes up the 2017 Monster Energy NASCAR Cup Series Playoffs. In its debut episode, Ryan Blaney is featured as he prepares for his first Playoff appearance in the Ford Performance simulator at Ford Performance’s Technical Center in Concord, NC. In addition, follow Dave Pericak, global director of Ford Performance, as he meets with drivers before the race. MOORESVILLE, NC – September 25, 2017 – Ken Block took on Pikes Peak in Colorado to make the historic climb up Pikes Peak today, in his 1965 Ford Mustang Hoonicorn RTR V2. The Hoonicorn powered through the twist and turns of Pikes Peak with 1,400 horsepower being generated from it’s twin turbo, methanol powered V8 engine built in Mooresville, North Carolina. Follow this unique behind the scenes 10-week video series from Ford Performance, documenting the various aspects of the Ford Performance NASCAR program. This week’s episode features Kurt Busch, Tony Gibson and the No. 41 Haas Automation/Monster Energy team at New Hampshire Motor Speedway while also highlighting how the Ford Performance Tech Trailer plays a major role at every race of the NASCAR Playoffs.